length overall 7" (178mm) blade length 2.5" (64mm) blade steel 8Cr13MoV length closed 4 22/26" (119 mm) cutting edge 2 3/16" (56 mm) weight 8 oz (228 g) hole diameter 15/32" (12mm) blade thickness 5/64" (2.25mm) handle material STAINLESS STEEL byrd byrdWrench As multitools go the byrdRench doesn’t resemble any other pocket tool on the market. 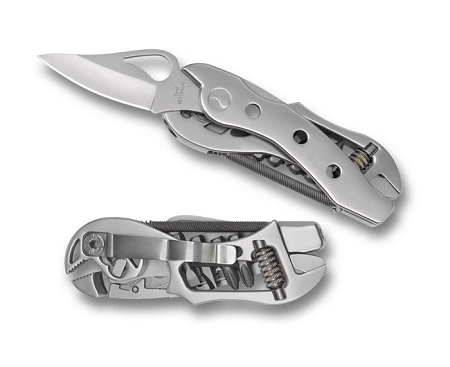 Unlike standard multitool fare it has a full-sized knife blade that opens/closes one handed and locks open like a real pocketknife. It also comes with a pocket clip and nylon sheath so if you’re a hang-it-on-a-belt-loop person or a clip-in-my-pocket-person, you’re covered. The tool’s housing is two stainless halves that join creating slip joint pliers (with a large or small bite) on one end and an adjustable 9/16” crescent wrench on the opposite end. Both work comfortably in the hand with contoured edges so there are no pinched fingers. Separate the two halves and tucked inside is a set of four screwdriver bits including: A #2 and #3 Phillips-head as well as a #1 and #2 flat-head. The bit housing accepts any standard 1/4" sized bit including Allen and Torx® wrenches to customize your tool arsenal. A rough file combination hole-starter slide into a spring set in the housing above the bits. A pivot holds the tool’s two halves together. When rotated, the pieces extend and lock into a full-length easy to grip and torque magnetized screwdriver or crescent wrench. Releasing the pivot separates the screwdriver and knife portion of the tool from the crescent wrench. This allows you to use the crescent wrench and the screwdriver/knife independently and/or simultaneously. High performance 8Cr13MoV is the blade’s steel and it comes in a plain cutting edge.